Amazing what two weeks will do. I missed the last two weeks of the Midtown Farmers’ Market while on a trip home (and enjoying the very fine Midland Farmers’ Market). You might recall that my last trip, while exciting because of the first appearance of asparagus, was a bit disappointing since that was the only fresh vegetable to be had. This week, the market really exploded with summer produce—I can finally buy (more than) enough fresh vegetables for the week. Greens. 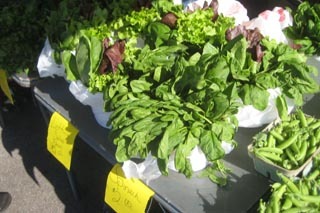 Greens are the most readily available thing right now: tons of lettuces, spinach, kale, bok choi and kohlrabi were available, as well as every kind of herb. 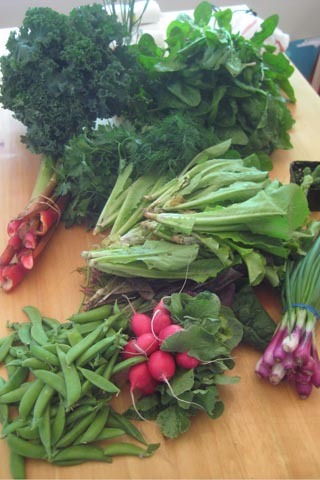 I picked up a bunch of kale, nearly a pound of spinach, and an assortment of salad greens. Not a bad deal for 6 dollars,though I had to spend about an hour washing and drying greens at home. A bunch of dill and a bunch of parsley came home as well since I had a use for them in mind. Roots. 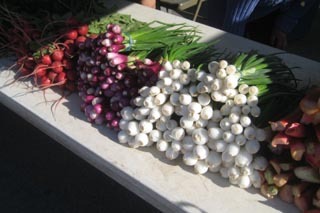 The first spring onions are available, and there are plenty of radishes to be had. So far, no sign of baby beets or turnips. 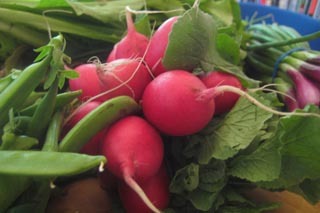 I cannot resist buying radishes whenever I see them, nor could I turn down sprightly little purple onions. Peas. Sweet peas were out in full force this weekend—every farmer seemed to have an abundance of them. They are sweet and tender. Rhubarb. Rhubarb, the herald of spring in these parts (along with asparagus), is still available. I have not had nearly enough rhubarb this year so I had to have some. I have some ideas for how to use all this great produce, but this is the first week where I have more fresh food than I know what to do with! I’m sure I’ll figure something out and have an empty fridge by next Saturday morning! 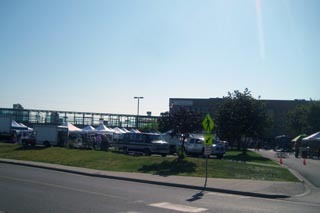 This entry was posted by Tom on Saturday, June 13th, 2009 at 11:33 am and is filed under Farmers Market, Minneapolis. You can subscribe to responses to this entry via RSS. This stuff looks so beautiful! Next time both Dave and I are off on a saturday (aka july 3rd if we’re in town) i’m totally taking him to the farmers market!